From CA And IN Warehouse. 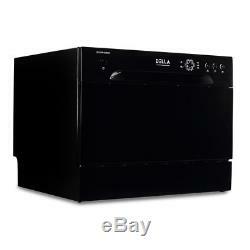 Countertop Stainless Steel Dishwasher Portable Compact w/ 6 Wash Cycles, Black. 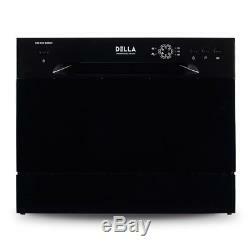 Our Compact Countertop Dishwasher provides all the convenience of a full-size dishwasher for cleaning your dishes. It features enough space to accommodate 6 standard place settings, making it perfect for singles, couples, apartments or the office kitchen. With easy-to-use, push-button electronic controls, it is designed with a stainless steel interior that includes a durable rack, silverware basket and cup shelf for easy loading. With our compact dishwasher, there's no reason to put off washing the dirty dishes until the morning. Compact For Small Kitchens&###xA0; - This countertop appliance is perfect for small sized household or individuals living in apartments, RV, or boat with limited space for huge kitchen appliances. 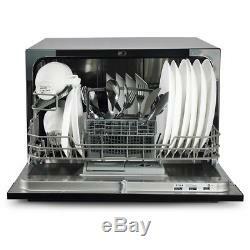 Easy To Use - Load your dishes and set the controls with ease. The detergent and rinse aid dispensers are easy to fill. User Friendly Controls - With simple to use control panel and light indicators. Program selector has 6 wash cycle options: heavy, normal, ECO, glass, speed, and rinse for your different dishwashing needs. Delay start option by 2, 4, or 8 hours. Heavy Duty Performance - Durable stainless steel interior, spray arm deliver many years of powerful, dependable washing; safe for temperatures up to 148&###xB0;F. Easy To Install &###xA0;- Handy dishwasher can be placed on top of a counter and fits perfectly under most overhead cabinets. When placing it on a counter, the quick-connect kit temporarily connects the dishwasher to your kitchen faucet where it drains directly into the kitchen sink. It eliminates the need for direct plumbing and permanent installation. 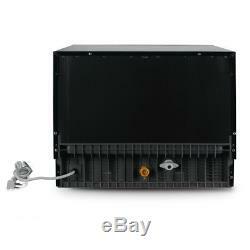 Total Amps: &###xA0;5.7A. Heavy, normal, ECO, glass, speed, and rinse. &###xA0;19"(L)&###xA0;x 21.5"(W)&###xA0;x 17(H). TheEveryMart is one of America top online suppliers of specialized Home Furniture, Home Appliances, Garden products, and High Quality Aftermarket Car Parts. For over 10 years, TheEveryMart has been providing customers years of insurmountable service. Our highly trained, professional staff provides in-depth knowledge and exceptional personal assistance to customers worldwide. Our number one commitment is to provide unbeatable service at unbeatable prices. Founded in the heart of Los Angeles California, our 400,000 sq/ft warehouse houses thousands of the most comprehensive collection of household tools, home & garden and aftermarket automotive items to fit any of your needs. TheEveryMart works closely with product manufactures, eliminating middlemen so we can pass the savings onto you. We look forward to building upon our tradition of excellence by continuing to provide exceptional products and services. From California - Los Angeles. Protective packing materials will be added in your package at no cost if needed. Assures our customers that they will receive all orders promptly and exactly as described. Used items will not be accepted for return. You have 24 hours from the time you place your order to cancel. Do you deliver on weekends? &###xA0; Why isn't my coupon working? Your coupon may have expired. Only one discount applies per order. Are there promo codes / coupons available for me? Do you have a showroom? We are only online at this time. Do you offer wholesale prices? We do not offer wholesale pricing. Do you offer any installation services? We do not offer installation services. I received an incomplete order missing parts, manual, etc. Why was my order cancelled? This listing is currently undergoing maintenance, we apologise for any inconvenience caused. 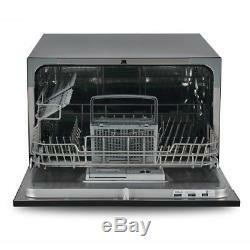 The item "Countertop Stainless Steel Dishwasher Portable Compact with 6 Wash Cycles, Black" is in sale since Thursday, August 9, 2018. 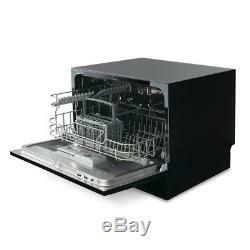 This item is in the category "Home & Garden\Major Appliances\Dishwashers". The seller is "theeverymart" and is located in Rowland Heights, California.